The three-day Battle of Gettysburg left 50,000 casualties in its wake, a battered Southern army far from its base of supplies, and a rich historiographic legacy. Unfortunately, due to sales rights restrictions, we cannot offer One Continuous Fight for sale in your country. The three-day Battle of Gettysburg left 50,000 casualties in its wake, a battered Southern army far from its base of supplies, and a rich historiographic legacy. Thousands of books and articles cover nearly every aspect of the battle, but not a single volume focuses on the military aspects of the important movements of the armies to and across the Potomac River. 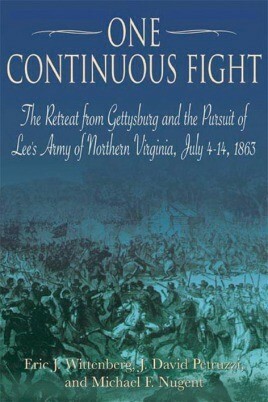 This book is the first detailed military history of Lee’s retreat and the Union effort to destroy the wounded Army of Northern Virginia. Against steep odds and encumbered with thousands of casualties, Confederate commander Robert E. Lee’s post-battle task was to successfully withdraw his army across the Potomac River. Union commander George G. Meade’s equally difficult assignment was to intercept the effort and destroy his enemy. The long retreat triggered nearly two dozen skirmishes and major engagements, including fighting at Granite Hill, Monterey Pass, Hagerstown, Williamsport, Funkstown, Boonsboro, and Falling Waters. President Abraham Lincoln was thankful for the early July battlefield victory, but disappointed that General Meade was unable to surround and crush the Confederates before they found safety on the far side of the Potomac. Exactly what Meade did to try to intercept the fleeing Confederates, and how the Southerners managed to defend their army and ponderous 17-mile long wagon train of wounded until crossing into western Virginia on the early morning of July 14, is the subject of this study. One Continuous Fight draws upon a massive array of documents, letters, diaries, newspaper accounts, and published primary and secondary sources. The result is a rich and comprehensive study loaded with incisive tactical commentary, new perspectives on the strategic role of the Southern and Northern cavalry, and fresh insights on every engagement, large and small, fought during the retreat.